RANKED alongside the Fokker Triplane as the best-known fighter aeroplane of WWI, the Sopwith Camel is meticulously described by Jack M Bruce in a top- selling DATAFILE now in its third printing! 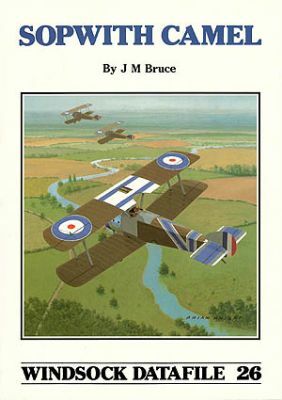 This volume covers the F.1 and as well as over 65 archive images, there are over three dozen detail close-up photos of the RAF Museum exhibit;cockpit and fuselage structure photos and sketches;detailed 1:48 and 1:72 scale plans by Ian Stair based on Sopwith factory blueprints of the F.I and Taper-wing Camels and a stunning centre- spread cutaway by Arthur Bentley with scrap views of internal fittings,armament and control system. In addition,Ray Rimell presents a detailed look at colours and markings along with three colour profiles and the book is rounded off with a model kit list and appendices making this the ultimate Camel reference for modelllers! Our earliest remaining issue of which only two copies remain. Includes Nightfighter Camel drawings, photos and profiles;metal Berg D.I build;Albatros D.IV model;FB5 cutaway and PC10 paint chips! Over 33 rare archive photos, 1:48 / 1:72 scale plans, and detailed colour notes with four colour profiles on the outer covers LIMITED AVAILABILITY. Les A Rogers details the famous Sopwith Camel fighter. Perfect colours' reference for this year's big scale WNW and Merit Camel kits!